NIGEL GORING-MORRIS • Department of Prehistory, Institute of Archaeology, Hebrew University, Jerusalem, Israel 91905. Figure 1. Map of south-central Levant showing the location ofKfar HaHoresh and several other contemporary Middle and Late PPNB sites. gradually collapse and disintegrate, at about which time smaller, more mobile and dispersed agropastoralist societies first seem to appear in both the Mediterranean areas, as well as in the semiarid periphery (Baird 1992;Ban-ning 1994; Betts 1988; Gopher and Gophna 1993;Goring-Morris 1994a). At one end of the scale are large permanently occupied villages with populations numbering in the hundreds, if not thousands, especially in the Rift Valley and in western Transjordan (e.g., 'Ain Ghazal, Kharaysin, Wadi Shueib, Beisamoun, Jericho, and Basta) as well as smaller settlements (e.g. Munhata, Wadi Ghwair, Beidha) (Edwards and Thorpe 1986;Kenyon 1979; Kenyon and Holland 1983; Kirkbride 1966, 1967, 1968; Lechevallier 1978; Nissenet al. 1991, 1992; Rollefson et al. 1992; Simmons etal. 1988, 1989). Smaller villages (e.g. Yiftahel, Abu Gosh) and hamlets (e.g. Nahal Oren, Horvat Galil, Nahal Betzet) are more characteristic in Cisjordan (Garfinkel 1987; Gopher 1989; Lechevallier 1978; Noy et al. 1973). Coevally, and not too far away, in the more arid periphery, small bands continued what was essentially an Epi-Paleolithic-type mobile foraging mode of subsistence, albeit probably more sophisticated, at small seasonally occupied sites (Bar-Yosef 1981, 1984, 1985;Betts 1990;Gopher et al. 1995; Goring-Morris 1994a; Goring-Morris and Gopher 1983). Notwithstanding this diversity, various aspects of the material culture remains demonstrate a high degree of homogeneity throughout the Levant, from southeast and central Anatolia in the north, to southern Sinai in the south, and from the Mediterranean east to the Saudi Arabian Desert. Information and exotic material exchange networks are well developed during the PPNB. 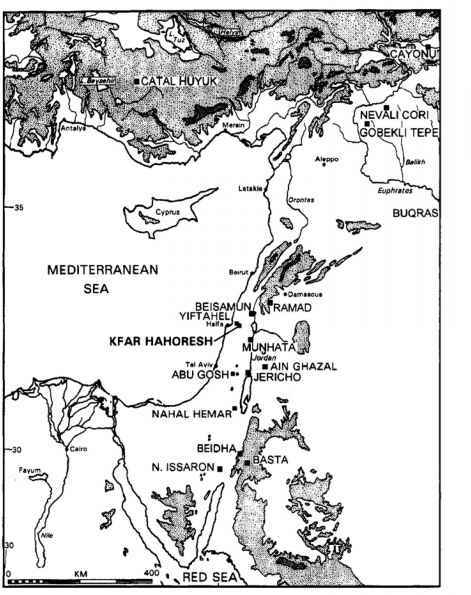 Accordingly this period throughout the entire Levant has widely come to be termed the PPNB koine after Kenyon's original terminology, Neolithic 2, or the PPNB "interaction sphere" (Bar-Yosef and Belfer-Cohen 1989; Cauvin 1994; Moore 1985; Rollefson 1990b). It has become increasingly clear in recent years that by at least the beginning of the PPNB, if not earlier, the hub of some of the demonstrated innovation in material culture had shifted from the south-central to the central-northern Levant (the middle to upper Euphrates), as opposed to the situation earlier during the Epi-Paleolithic. 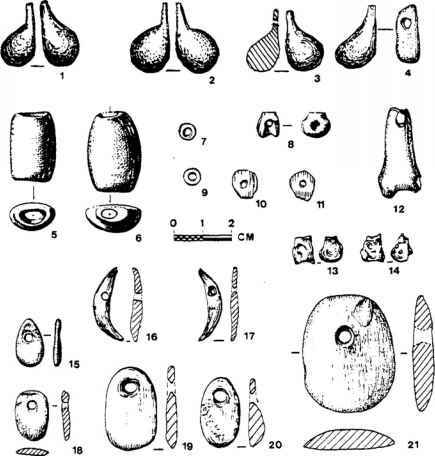 This is perhaps most graphically illustrated by chipped-stone lithic technologies and typologies (Gopher 1990). Byrd 1987;Bar-Yosef 1984; Goring-Morris 1994a). Other local architectural traditions are also apparent on the Euphrates and further to the north, as are different iconographic themes (Aurenche and Calley 1988). There are also subtle, regional stylistic differences in such aspects as basic lithic technology and projectile point morphologies (Gopher 1994; Nishiaki 1994; Schmidt and Beile-Bohn \1996). These and similar stylistic phenomena presumably reflect more localized intercommunity interactions and ties, in addition to chronological vectors. Until lately it was widely believed that both farming and herding were already well established throughout the Mediterranean zone by the beginning of the PPNB. However, while cultivation of domesticated plants had been initiated by the later stages of the PPNA in the south-central Levantine Corridor, goat husbandry appears only during the course of the MPPNB, as documented at 'AinGhazal, and perhaps also at Yiftahel and Kfar HaHoresh (Kohler-Rollefson, Gillespie, and Metzger 1988; Horwitz 1987, 1993; Kohler-Rollefson 1989). The stresses, dislocations, and impact of suchrapid changes in lifestyles, with increasingly larger populations in permanently occupied settlements, must have been considerable. The emergence of incipient social hierarchies and ritual ideologies were necessary to regulate and codify increasingly complex interpersonal, intragroup and intergroup relationships (see Flannery 1995). This would be reflected in such aspects as control over, and access to, a variety of resources, including land tenure, ownership, and inheritance, as well as communal ventures, kinship relations, changing gender roles, etc. Yet the seemingly profane aspects of material culture appear to indicate that PPNB society was basically egalitarian in outlook (notwithstanding Byrd and Monahan 1995). Indeed to date the only obvious evidence for the emergence of some form of social hierarchy is in the fluorescence of ritual and ceremonial aspects of the material culture, often associated with mortuary practices, which surely represents only a fraction of the PPNB ideological belief system. The major role of ritual and ideology in the PPNB has long been documented in the southern Levant from the excavations atJericho in the Jordan Valley, and at Ramad in southwest Syria, as well as more recently especially from excavations at 'Ain Ghazal near Amman, Nahal Hemar Cave in the Judean Desert, with plastered human skulls, stone masks, and near-life-size human sculptures (Bar-Yosef and Alon 1988;Cauvin 1972; de Contenson 1992; Garstang 1935; Kenyon and Holland 1983; Rollefson 1983, 1986; Rollefson et al. 1992; Simmons et al. 1988, 1990). Paralleling these finds have been equally spectacular remains from the northern Levant and beyond at Catal Huyuk in south central Anatolia, Cayonu, Hallan Cemi, Nevali Cori, and Gobekli Tepe in southeast Anatolia, including cult rooms, charnel houses, domestic shrines, and, most recently, ritual and funerary sites, together with a rich and distinct iconographic monolithic symbolic statuary (Hauptmann, 1993, 1997; Mellaart 1967; Ozdogan and Ozdogan 1990; Rosenberg and Davis 1992;Schmidt 1995). Most ubiquitous among what were clearly deeply rooted belief systems was the practice of postmortem skull removal (Cauvin 1972, 1994), a tradition originating at least two, and more probably four millennia earlier, in the Epi-Paleolithic Natufian cf the southern Levant (Belfer-Cohen 1990). There is widespread agreement that this tradition and associated practices, such as the modeling of features on skulls, represent some form of ancestor cult, most probably focusing on veneration of semimythical heroes (Arensburg and Hershkovitz 1989; Bar-Yosef and Alon 1988; Cauvin 1972, 1978; Hershkovitz and Gopher 1970;Kenyon 1979; de Vaux 1966). Yet detailed archaeological documentation of mortuary practices and the spatial and conceptual relationships between the dead and the living are commonly lacking (see, however, Garfinkel 1994;Kuijt 1995,1996). It is within this perspective, among others, that an ongoing excavation project at Kfar HaHoresh in the lower Galilee promises to shed light (Goren et al. n.d.; Goring-Morris 1991,1994b, 1995; Goring-Morris et al. 1994-95,1995; Hershkovitz et al. 1996). A brief description of variability in the specifics of mortuary practices already documented at Kfar HaHoresh follows. *This data is complemented by comparisons to other PPNB and PPNA and Epi-Paleolithic Natufian sites in the southern Levant. This demonstrates that, in addition to postmortem skull removal, many other specific aspects of PPNB ideological, ritual, and mortuary practices may be directly traced back some two to four millennia to the Early and Late Natufian. Finally, I attempt to examine the information from a wider developmental perspective, taking into account socioeconomic transformations.